Day 1 of Cerebral Palsy Communications Camp where parents attend training session given by a two qualified Speech and Language Therapists. In 2014, Chance for Childhood’s Education, Equality and Empowerment (EEE) project mapped out individuals living with disabilities in Gakenke District in Rwanda’s Northern Province. Moreover, we wanted to know exactly how many children and youth with disabilities have learning difficulties, as school-age deaf children’s right to education was not observed and they often end up in child protection cases. Whist the mapping highlighted those with hearing impairments, it also identified 53 children with Cerebral Palsy (CP). Because of the health condition and a string of care and responsibilities that come with taking care of children with CP, families of these children often see them as a problem, a curse or even useless. As a result of this attitude, we recognised the need to address some of these problems that such families were struggling with. EEE project staff found that the first problem to be dealt with was the communication barrier between parents and their children with CP. And so a series of Communications Camps were created for families with children of various disabilities. 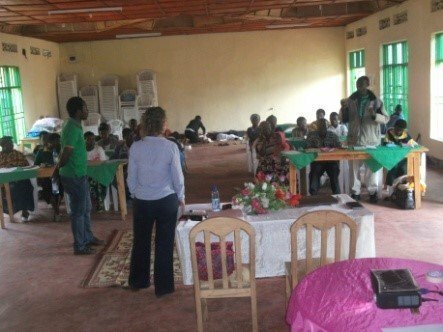 The first communications camp for children with CP took place in Gakenke District (10-12 June, 2015) involving the participation of twelve families raising children with Cerebral Palsy. The objectives of the camp was to: provide training in CP, communication, and play so that parents can have a more in-depth understanding of the disability and can begin to develop an effective communication system to use with their child; provide training in safe feeding and swallowing to ensure the health and well-being of children at home; and provide an opportunity for families of children with CP to come together to establish local networks for advocacy and support. On the first day, parents learned about CP (causes, risks, treatment/rehabilitation, and complications) while their children were looked after by and played with EEE project social workers. At the end of the day, along with the newly gained knowledge on CP, parents changed their opinions on their children and no longer see them as a curse. Day 1. Parents interact with our Speech and Language Therapists during training. In the evenings, the parents watched educational videos on children with Cerebral Palsy and continued to learn about the different ways they can interact with their children. The next day, parents are taught that their children can learn through play. Different positions can make a child do/play different things/games. Some parents also never knew that they could make their own toys from locally available materials (i.e. bottles, tins, thread, needle, beans, stones, rice, etc.) that could enhance their children’s motor skills during play. Day 2. Parents and children learn how to play safely and make toys using local materials. More surprisingly, some parents have discovered that their children could write and/or perform tasks that require fine motor control; this was something the parents never had the chance to explore up until the camp. Day 2. 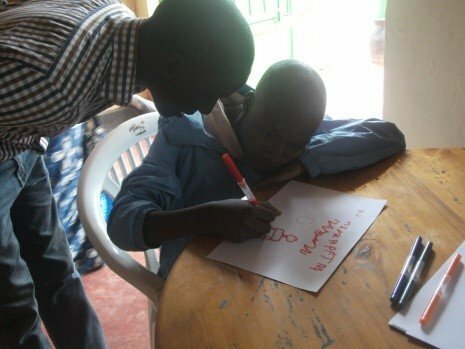 A child with Cerebral Palsy is assisted to write and draw. On the last day, parents were taught different feeding positions and techniques to use with their child. This session was of particular interest to all families as they have reported that feeding has been a very difficult problem and it usually takes a lot of time. Further discussions with parents on food preparation also took place. Day 3. Parents learn about safe feeding and food preparation for their children. Finally, to ensure that parents will practice and implement what they have learned from the three-day camp and that they will improve their communications with their children with CP, we helped them form a Parents’ Advocacy Group. The group named themselves ABISHYIZE HAMWE, meaning people who joined their efforts together. Through the advocacy group, we hope that these families can continue to support each other in their children’s upbringing, exchange tips, and even advocate for the rights of all children with CP in their local communities. The camp was overall a huge success! This experience has truly confirmed the need to educate the community on disabilities and to especially offer specialised care to children with disabilities and support for their families. It is obvious to us that many of these children have so much potential to learn and strive but due to the lack of communication skills and familial support, they have no options but to be confined to the walls of their home. This is only the beginning of the communications camps not just for families with children with CP but also for children with Hearing Impairments, Autistic Spectrum Disorder, Profound and Complex Learning Disabilities, and Severe Learning Disabilities. It is our wish to see all these children having equal learning opportunities as their peers and grow up living happy and healthy lives. Written by Felicien Turatsinze – EEE Project Speech and Language Therapist Assistant. Edited by Connie Wu, Programmes and Fundraising Assistant at Chance for Childhood.